These unisex womens / mens diabetic socks are the best for swollen feet, swollen ankles, and swollen legs. Amazingly Extra Wide Fit socks and Stretchable. Medium-Weight Large Diabetic Care Socks are fantastic for swollen feet, swollen ankles, diabetics and individuals with foot edema. 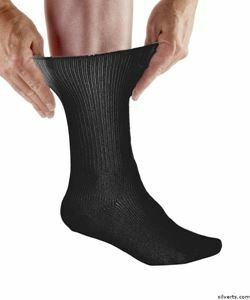 These stretch socks are excellent over creams at night. These plus size womens socks and mens socks are great for a swollen ankle injury, sprain, sore foot and swollen feet. Will even go over casts. These easy on socks by Silvert are absorbent, non-constrictive, pre-shrunk 100% cotton. Terrific for seniors/elderly with swelling.